Post author Mirsky displays two varieties of garlic grown at Seed Savers Exchange during a workshop held at the organization's 2017 Conference and Campout. That’s not a question most of us typically ask one another, but at Seed Savers Exchange it’s often posed among our staff, especially at this time of year. Three weeks ago, 290 varieties of garlic were first harvested from the field and then set out to cure in a large shed at Heritage Farm, where they have created a beautiful display of essentially the entirety of garlic diversity known in the United States. Come early October, those garlic bulbs will be separated into cloves and replanted in our fields once again, a cycle that has repeated itself for decades. In stark contrast to this annual harvest, the diversity of garlic available for purchase in supermarkets today is analogous to that of apples in the early 1980s, when Washington State’s production of 'Red Delicious' dominated the U.S. supply. California currently accounts for 80-90 percent of all garlic grown nationwide, and the vast majority of that garlic is one of two varieties: ‘California Early,’ most often used for dehydrating, or ‘California Late,’ harvested for fresh eating. Recently, however, China has flooded the U.S. market with cheap imported garlic that has severely undercut the California garlic industry and come under scrutiny for food-safety reasons. And that means the time is ripe for the garlic found in the Seed Savers collection to explode onto the culinary scene and backyard gardens around the country. Last year, 216 collection varieties were available either directly from Seed Savers Exchange or from other listed Seed Exchange members. As this season’s crop was especially good, we hope to offer at least as many varieties this coming year. The 'Conti Family Heirloom' garlic is on track to debut in the 2018 Seed Savers Exchange catalog. Much of our garlic collection’s diversity can be attributed to John Swenson, a longtime Seed Savers Exchange member and friend. In 1989, John joined representatives of the USDA, the Vavilov Institute, and the Polish Research Institute on an expedition to Central Asia to collect wild germplasm of various Allium species for use in U.S., Russian, and Polish breeding programs. Upon his return, he made 66 new varieties available through the Seed Savers Exchange Yearbook; 45 of those varieties were released commercially―including the well-known ‘Samarkand’ (aka Persian Star). In addition, our collection includes 15 documented heirlooms (varieties that have been passed down from generation to generation). One―a hardneck variety with large, light violet-streaked bulbs and brownish cloves called the ‘Conti Family Heirloom’―is on track to be introduced in the 2018 Seed Savers Exchange catalog. We received this variety in 2012 from Chad Royer of Canton, Ohio, who has grown it in his garden since receiving it from his father-in-law, Louis Ferrett Sr., in 2002. Louis has nurtured the variety in his garden in Leechburg, Pennsylvania, since 1950, when he acquired it from a friend of the family, Germano Conti, after whom the variety is named. In 1917 Germano brought the garlic with him from Italy, where his family had lovingly grown it. Equally noteworthy is a unique garlic variety, ‘Asian Tempest,’ donated to Seed Savers Exchange by Horace and Helen Shaw, acquaintances of John Swenson. In the early 1980s, the Shaws were berry picking close to their hometown of Adams, Oregon, in the foothills of the Blue Mountains. On their way home, they stopped at a farm advertising garlic. Horace, a garlic enthusiast, noticed an unusual variety with very long umbel capsules on the scapes (the flower shoot of the garlic plant). The farmer, Helen would later recall, had fought in the Korean War and married a Korean woman, who had brought a few cloves of the variety to the United States with her. Also a hardneck type, ‘Asian Tempest’ boasts bulbs beautifully streaked with red and containing six to 10 vividly red cloves each. It is known for its exceptionally fine flavor. A garlic lover's dream: a dozen varieties are readied for tasting at the 2017 Conference and Campout. Unfortunately, flavor is a characteristic often overlooked in garlic, albeit not by Chester Aaron, author of the popular memoir Garlic Is Life, and certainly not at this year’s Conference and Campout at Heritage Farm. The weekend featured a taste trial that included olive oil infused with 12 varieties of garlic, many renowned for having a rich, deep, complex flavor. Varieties such as ‘Spanish Roja,’ ‘Romanian Red,’ ‘Nootka Rose,’ ‘Creole Red,’ and ‘Asian Tempest’ proved highly popular. All are available through our Seed Exchange. 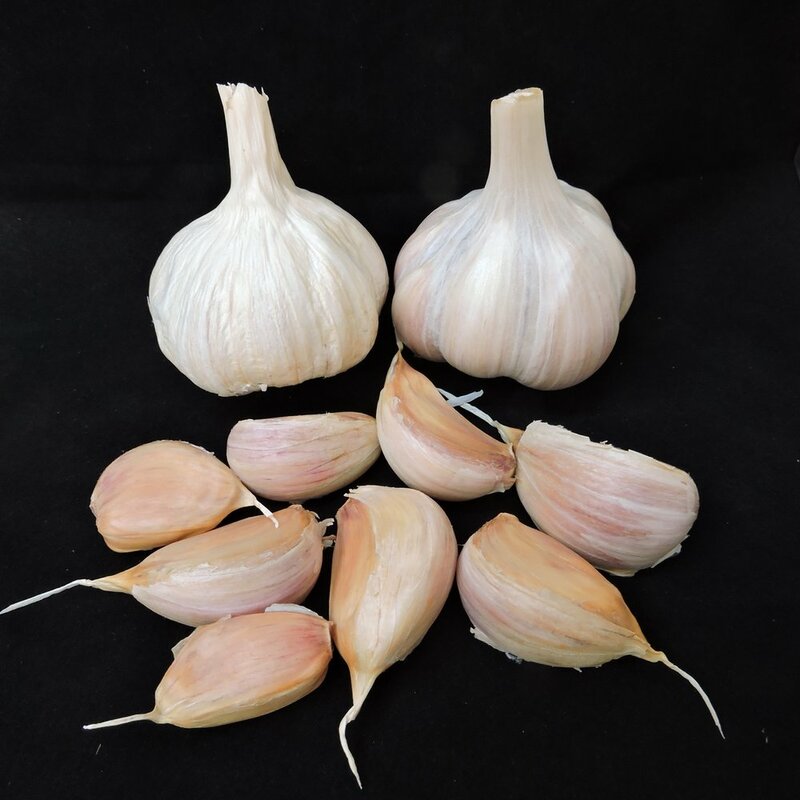 And while we at Seed Savers Exchange continue to ask each other the question, “What’s your favorite type of garlic?,” we also find that question nearly impossible to answer because of the flavor and other culinary attributes of the many varieties in our collection, ‘Conti Family Heirloom’ and ‘Asian Tempest’ among them. This fall, why not expand your garlic horizons and add a depth of flavor to your dishes that will delight you? After all, as Aaron so poignantly noted in his memoir, garlic is life.